& IDA VIOLA THORNTON (2-16-1875 AL). At this time we do not know his father, but there is a record of a Yancy Thornton born 1768 died 1814 son of John Thornton in VA and NC who later moved to GA. Could this Yancy have been our Yancy Thornton's Grandfather? 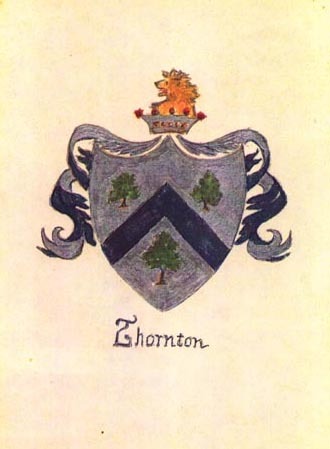 Background Thornton Coat of Arms drawn by Martha Carter of Gainesville, VA.